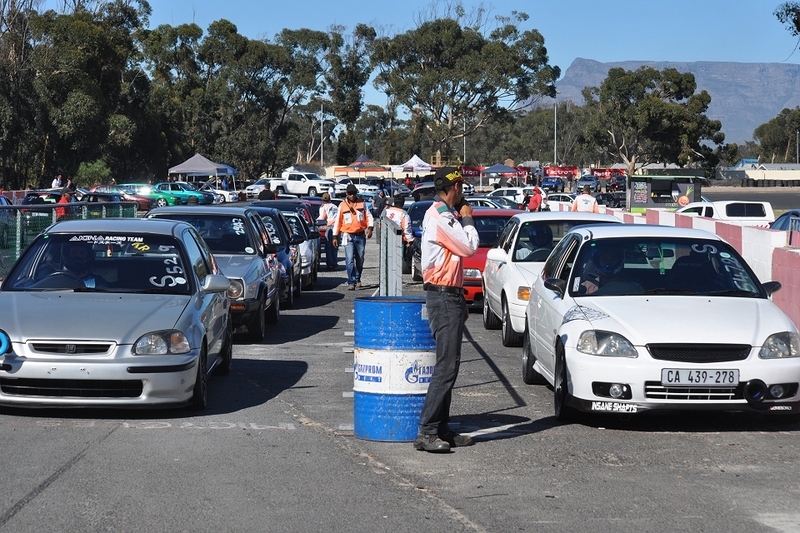 The first Street2Strip event at Killarney International Raceway in several years, on Saturday 23 March, created quite a hype amongst street racers, many of whom had been asking for an opportunity to run ‘against the clock’ on the Killarney Quarter-Mile. Just as on the street, no times are recorded at the regular Wednesday night Robot Racing events; whoever crosses the finish line first is the winner. Street2Strip, however, uses the full ‘Christmas Tree’ setup of professional-level MSA drag racing, and measures both elapsed time and terminal speed to three decimal places. But first you have to stage; that means, after warming up your tyres with the traditional ‘burn-out’, you have to park the front wheels of your car between two light-beams, with only centimetres to spare. When all eight white lights (four per car) are on, the starter presses a button and four yellow lights go on in a rapid downward sequence, before the green light at the bottom signals that it’s time to go. This is where it gets tricky; the sequence takes exactly 0.4 seconds; if you are still waiting when the green light goes on, you’ve already lost, because the other driver will leave you standing – but if your car breaks the light-beams before the green light goes on, a red light will signal that you’ve been disqualified. It’s a lot more complex than it looks and it all happens far too quickly to think about; it has to be done on muscle memory. 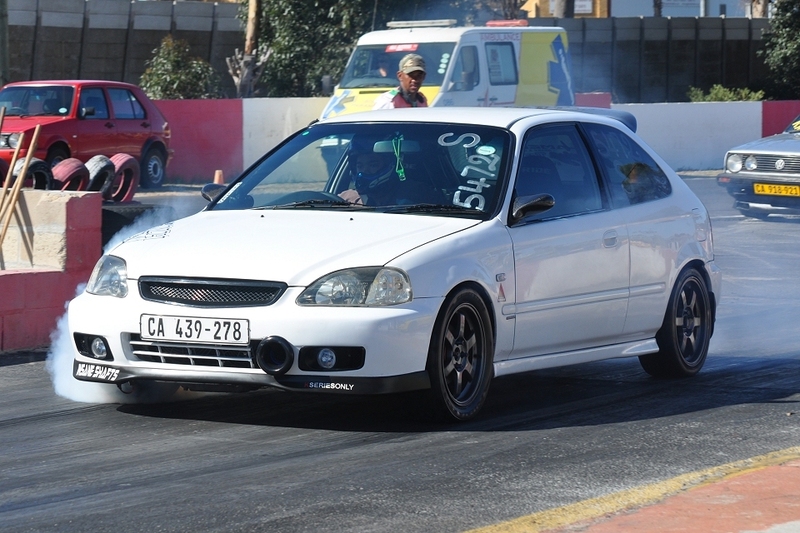 Staging is a strange combination of brute force and ear-splitting noise one moment, and total precision driving the next. For many Robot Racers, this was the first time they had experienced a Christmas tree start and many struggled to stage accurately (or staged using their rear wheels instead of the front!) and there were a number of red-light starts. Nevertheless, or perhaps because of it, there was a definite feel in the air that this was a Big Deal, that the Robot Racers were being challenged to step up and produce their A game, encouraged by a large crowd of spectators that roared their approval every time commentators Zaid ‘Uncle Figo’ Kriel and Ernest Page announced a noteworthy time. 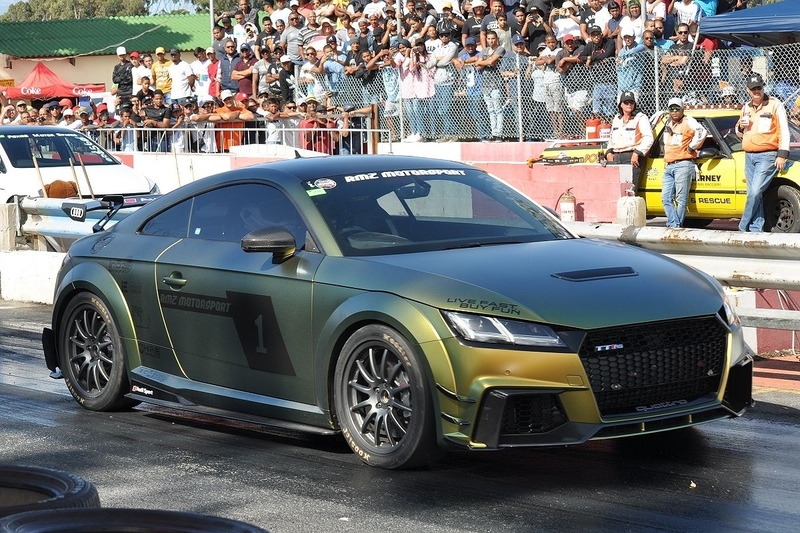 The atmosphere was festive, the support from the stands exuberant, and some of the times were noteworthy indeed, including a number of non-standard but street-legal, locally built cars that ran under 13 seconds, and Rameez Amanjee’s beautifully prepared dark green RMZ Motorsport Audi TTRS Quattro that got into the mid-10s on street tyres, with ordinary ‘pump’ fuel.